Opening October, 2015, the Easton Public Market will be a old-world style grocery store in the heart of Easton. EPM will contain a farmstand, an on-site butcher, a fish stand and much much more. EPM will take SNAP benefits and will strive to serve the community fresh, affordable, local foods. Nature’s Way opened their doors in 1975 in historic downtown Easton with the vision of introducing the public to healthy products and living. 40 years later they are still doing just that but with more expertise. Vietnamese grocery in downtown Easton with an exotic array of fresh produce and stocked items. America’s oldest continually operating outdoor farmers’ market. Saturdays from 9-1, Wednesdays from 5-8, From July-August Wednesdays from 5-9. SNAP and FMNP program benefits can be used. All vendors provide local goods and produce for reasonable prices. The Nazareth Farmers Market brings local merchants direct to the Nazareth Community. Farm fresh produce, grass-fed meats, homemade baked goods, fresh jams, flowers, peanut butter, cheese and kiffles are sold weekly. Stroll the market for handmade jewelry, goat milk soaps, essential oils, homemade pet treats and more! And check the calendar for monthly events! Home to 12 vendors with fresh produce, baked goods, flowers and lunch items. Offering the freshest seasonal produce and unique specialty products from almost 40 local vendors! A unique Friday outdoor market with a range of vendors and products. A selection of organic food, local specialties, crafts, vegetables and fruits. Accepts WIC! 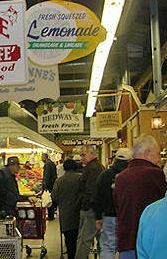 The Allentown Fairgrounds Farmers Market invites you to visit with over 65 merchants. Meats, poultry, produce, deli, baked goods, gourmet shops, seafood, candy, snacks, flowers, restaurants, and much more can be found here. The farmers’ market is Stroudsburgâ€™s finest, offering quality produce, plants, flowers, eggs, dairy products, raw natural honey, fresh baked breads & pastries, jams, jellies, syrups, hand roasted gourmet coffee, homemade pasta, sauces, fine wines, handmade soaps, candles, and more! Bath Farmers’ Market will be back for another fresh season. Support your local farmers, meet friends, and find delicious fresh-from-the-field meats and produce at your neighborhood producer-only market! Visit Raubâ€™s Farm Market in Easton, PA for fresh fruit, vegetables, homemade pies, jam and more. Klein Farms offers fresh raw milk, handmade cheeses & yogurt, eggs, beef, honey & seasonal produce in their on-farm Dairy Store. For more than 60 years, Scholl Orchards has provided our community with home grown fruits and vegetables, all grown, raised and picked by farmers in the Lehigh Valley area. Food pantry and clothing distribution.